The Jordan River during summer before it meets the Dead Sea. 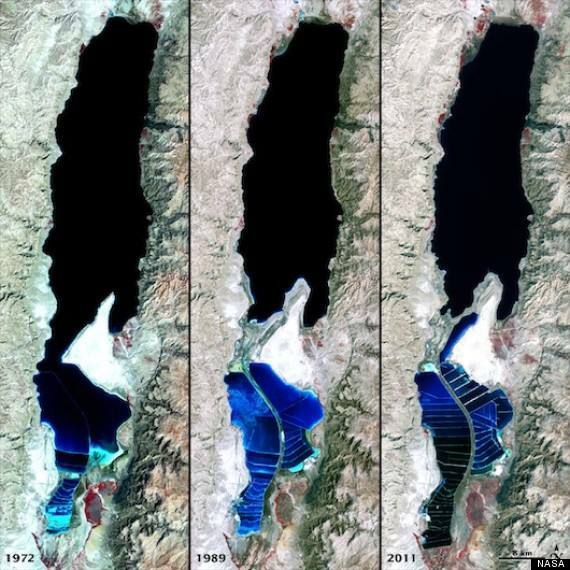 The Dead Sea is one of the most visible examples of water level decline, losing as much as five feet each year. 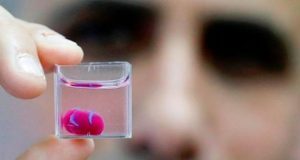 Scientists fear that it may be reduced to only a “tiny pool” by the middle of the century. “Its a lesson to everyone: don’t mess with nature because nature will always win and we will always lose,” said Ofir Katz, an Israeli ecologist at the Dead Sea and Arava Science Center. The Sea of Galilee and Jordan river previously supplied Israel with the majority of its fresh water needs. But, after inventing the technology known as desalination which is now used around the world, Israel has reduced dependence on the lake and river and instead generates 65% of its water needs from the Mediterranean. 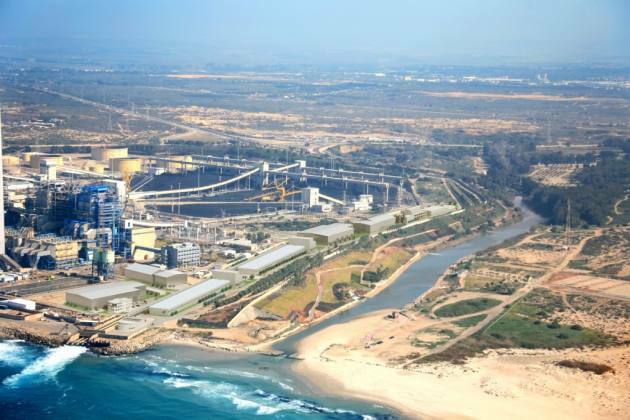 The Hadera desalination plant in Israel is now the world’s largest. The primary issue today is less rain, as historically dry periods have returned to the area and unregulated water is being taken from tributaries flowing into the Jordan and Sea of Galilee. Lebanon, Syria, the Palestinian Authority and Jordan now take substantial amounts of water from rivers and streams that, in the past, kept the Sea of Galilee, and the Jordan that flows from it, at sustainable levels. Israel has responded by supplying Jordan and the PA, free of charge, billions of cubic feet of water from its desalination plants through new pipes running from Israel through Samaria into Jordan. “If we keep taking fresh water from nature, from the Sea of Galilee, or from the Euphrates for example, or the Nile, we will eventually ruin the local environment. “We need to take care of nature or else we all sink with it,” stated Katz. 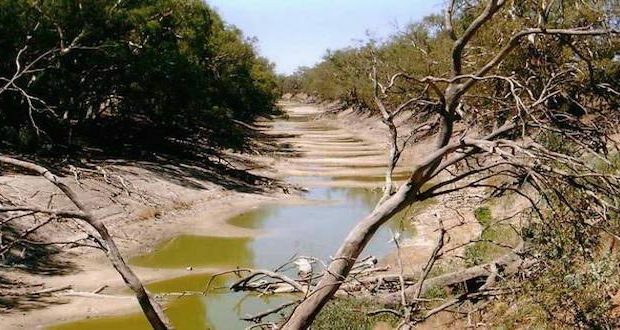 The shrinkage has been blamed in part on the expanding population in the region and increased need for water, as well as on factories mining minerals by evaporating the water. Bromberg called for more joint work on desalination plants to counter the problem. The Israeli government is already considering pumping fresh water, made from desalination, into the Sea of Galilee and using the “sea” as a holding place for fresh water. The move would also help save the fishing industry in the Galilee. “Manufacture more water in the Mediterranean, produce renewable energy in the desert areas and create healthy interdependencies amongst us Israelis, Palestinians and Jordanians first. Or we’re going to see potentially more conflict rising out of these increasingly scarce water resources,” he said. The problem is that Jordan is currently housing over a million refugees from Syria and Iraq with little room in its budget for water projects. Likewise, the Palestinian Authority has mismanaged billions given it by the international community and the U.N. over the last few decades with little money actually going to infrastructure projects. The result is increased costs for fresh water for the entire region of Israel, which continues to provide free water to Jordan, Palestine – and even the Gaza strip – with no financial help from the international community. Israel realizes the importance of the water sources and their significance to history. 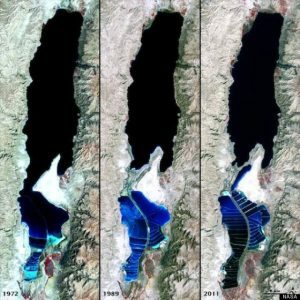 NASA images from space show the shrinking Dead Sea. Israel and Jordan may cooperate to pump sea water from the Red Sea through the desert to fill it up. The Dead Sea and the areas around it have been the site of some of the most important finds in Biblical archaeology, such as the world-famous Dead Sea Scrolls. 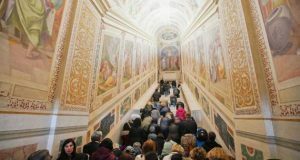 The fragments, which contain manuscripts of some of the earliest Biblical writings, are believed to have been hidden in caves somewhere in 68 BC in order to protect them from Roman soldiers. They were found in a series of discoveries between 1947 and 1956, with close to 900 fragments written on animal skin and papyrus in Hebrew, Aramaic and Greek, and subjected to analysis by researchers for decades. In November, scientists suggested that a “superheated blast from the skies” destroyed cities near the Dead Sea 3,700 years ago, alluding to the destruction of Sodom, as described in the Bible. Archaeologist Phillip Silvia of Trinity Southwest University in Albuquerque, New Mexico, said at the time that unearthed minerals were found to have instantly crystallized at high temperatures at what used to be cities and farming settlements north of the Dead Sea. 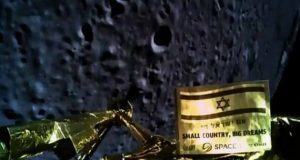 As Israel’s economy continues to outpace that of most developed countries in the world, including the United States, China and Japan, construction sites are constantly uncovering new sites for archaeological exploration. Those digs, like the water projects, need funding. 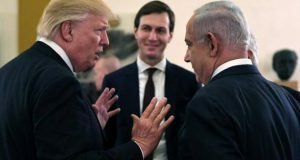 Israel may soon have that funding as it prepares to be a net energy exporter with the completion of natural gas rigs off its cost that could make it the number one natural gas exporter in the world – even surpassing that of the United States. The discovery promises to change the political climate in the region as Israel supplies not only water, but gas energy, to former enemies. 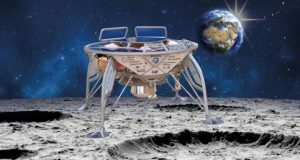 Countries like Lebanon, Turkey, Greece, Egypt and Syria all say they want to work with Israel in using those discoveries to fuel their energy needs in the coming years. Previous: Is this the greatest hymn ever written about Jesus?